Are you looking to buy hCG pregnancy test strips in bulk? Then our pregnancy test strips are likely to impress you abound. Meant to detect pregnancy at an early stage, you just have to shell out as low as $.029 per strip. You can buy them in a pack of 25 strips to meet broader user needs. Each pregnancy strip is convenient to use, so you can conduct pregnancy detection even at home. The pregnancy strip notifies pregnancy after coming in contact with human urine. You can get immediate results, so no agonizing wait here. 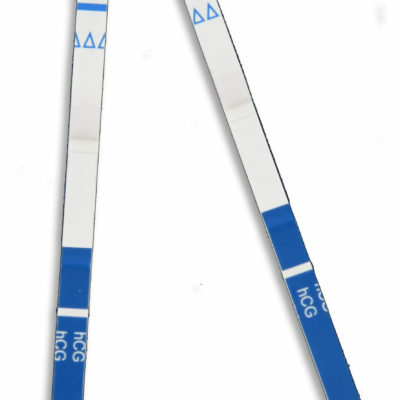 The hCG Rapid test strip (urine) is a rapid visual immunoassay for the qualitative, presumptive detection of human chorionic gonadotropin in human urine specimens. This kit is intended for use as an aid in the early detection of pregnancy. Register and shop online now! Remove the pregnancy test from each sealed pouch and use it as soon as possible. For best results, the pregnancy test should be performed within one hour. Hold the pregnancy test strip by the end, where the product name is printed. To avoid contamination, do not touch the strip membrane. Holding the strip vertically, dip the pregnancy test strip in the urine specimen for at least 10-15 seconds. Do not immerse past maximum line (MAX) on the test strip. As the test begins to work, color will migrate across the membrane. After the pregnancy test strip has finished running, remove the strip from the specimen and place it on a non-absorbent flat surface. Start the timer and wait for the colored band(s) to appear. The result should be read at 3 minutes. Do not interpret the result after 10 minutes. Positive: Two colored bands appear on the membrane. One band appears in the control region(C) and another band appears in the test region (T). Negative: Only one colored band appears, in the control region ©. No colored band appears in the test region (T). Invalid: Control band fails to appear. Results from any test which has not produced a control band at the specified read time must be discarded. Please review the procedure and repeat with a new test. If the problem persist, discontinue using the kit immediately and contact your local distributor.